Many young boys enjoy building train sets, often this hobby spills over into adulthood and now at Maldon Shed it has grown into a team of Shedders working together to put together a nine foot train complete with carriages. The impressive train which is destined for Great Bentley station was commissioned by Essex County Council and has been a labour of love over the past few months for the men regularly attending Maldon Shed. 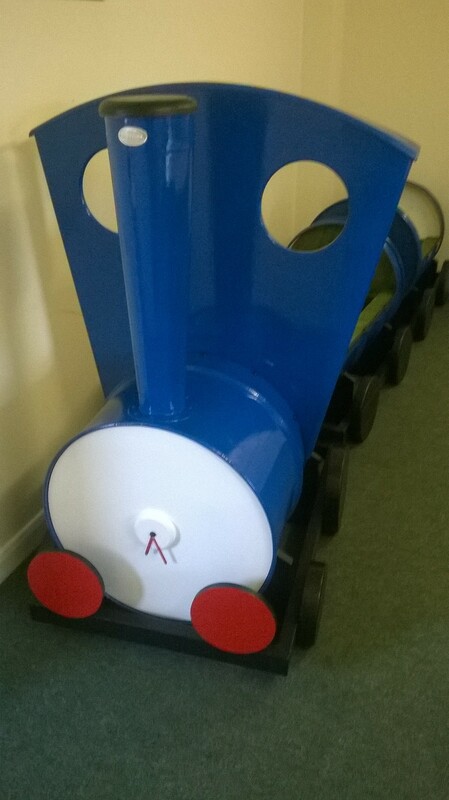 The carriages and main body of the train are made out of old oil drums, cleaned, cut down to be able to hold planters and painted a bright blue. These sit comfortably on top of wooden cradles that also hold shiny black wheels and bumpers. The Maldon Shed is a team of people who share a love of woodwork and other practical activities. Whether they are beginners or people with years of knowledge and experience they are welcome to be part of the Shed. Volunteers support the Shedders as supervisors or lead hands – people with knowledge of workshop safety but can also help with marketing, promotions, attendance at events or admin support. Anyone who would like to be involved is welcome.